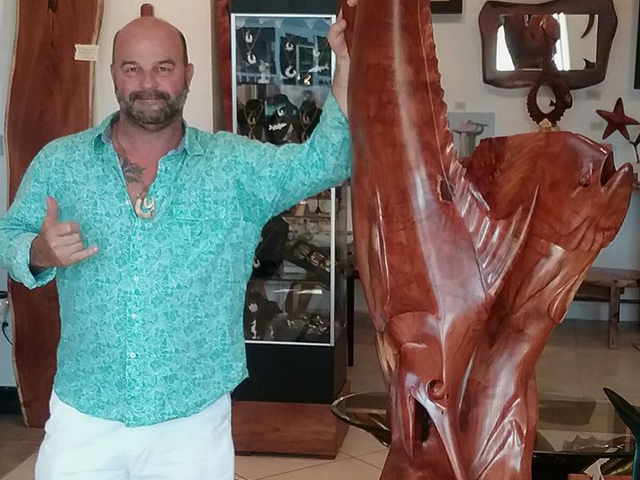 Marine artist David Wirth draws upon his time on the water and in the woods to create works of art..
Marine artist David Wirth works in a number of mediums but is best known for his wooden sculptures, Polynesian-style fish hooks and furniture. Originally from California, Wirth spent several years in Hawaii and now resides in the Florida Keys. His studio is located in Islamorada and is open to the public. You can also see his latest creations at davidwirth.com. While living in Maui David Wirth received a special blessing from an elder to make these spiritual hooks. "I make art to fish and hunt, and I fish and hunt to make art," says David Wirth. His wife calls him a "complicated caveman," but Wirth's love of the outdoors is what fuels his creative juices. The well-known sculptor, artisan, craftsman and jeweler works in a number of mediums to capture his love of the outdoors. Wirth, now 54 years old, got the push he needed to become an artist 26 years ago after he spent 10 days in an intensive care unit recovering from a horrible case of chicken pox contracted from one of his kids. The disease affected him both externally and internally, there wasn’t a centimeter of his skin that didn’t have a blister on it. He actually flat-lined at one point during the struggle. "If I wasn't allowed to be around fish, the only option I had was to make one..."
When Wirth came out of the hospital, his immune system was so compromised that he couldn’t be around any fish or wildlife. He went from fishing and hunting 200 days a year to zero. He had to stop cold turkey, and his soul longed for that time outside. “If I wasn’t allowed to be around fish, the only option I had was to make one,” he said. The first fish he decided to carve was a rainbow trout. He went to work without any pictures. He brought the memories in his mind to life in the wood. The finished product still hangs in his studio to this day. That one sculpture ignited a career that has spanned more two decades. Wirth’s Polynesian-style fish hooks have become ubiquitous with his name. He makes them out of wood, bronze and even bone. 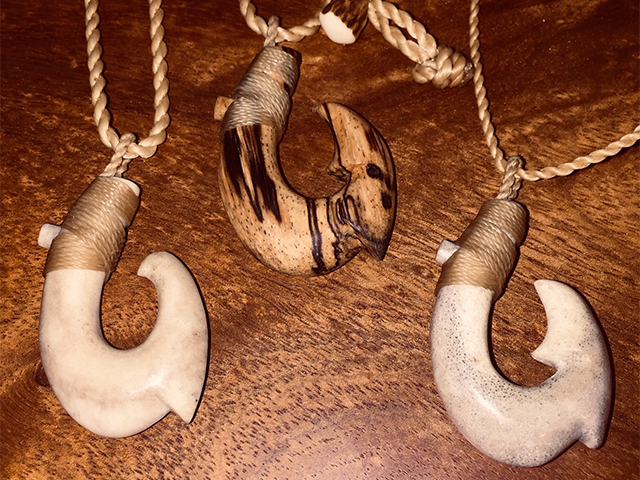 He received a special blessing to make these spiritual hooks from an elder while living in Maui as part of a very old tradition. That connection is what keeps Wirth carving and sculpting. “I really don’t do it for money, I do it as sort of a mission while I’m here on this earth,” he says. Wirth works with many fishing tournaments that use the hooks as their premiere trophies. The business has become a family affair. Bobbi Wirth, David’s wife handles all of the logistics of their company. “I do everything but make the art,” she says. Wirth has won several awards over the years for his sculptures and has been featured in magazines, but it was never competition that fueled Wirth’s creativity. His abundant love for wildlife is what inspires him to keep crafting. “I think everyone is born with a creative talent, it’s just how you direct it to get through life,” he says. Originally from Carmel, California, the Wirth’s now live in Florida, and this is where he creates the bulk of his artwork. 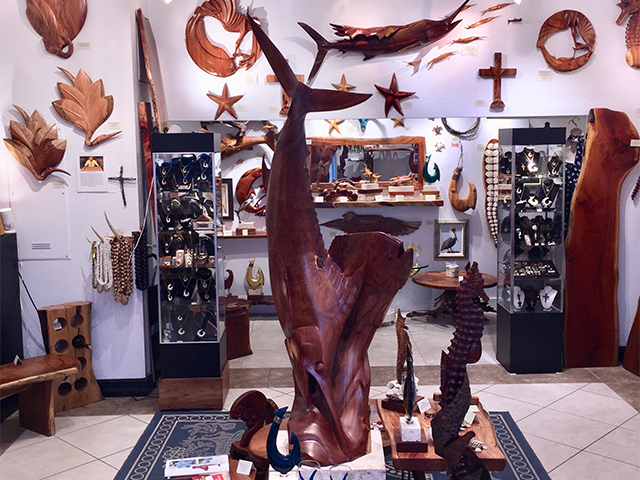 David’s gallery is located in Islamorada in the Florida Keys and customers are welcomed to stop by and view his work first hand. Too see more of David Wirth’s work visit davidwirth.com.